President Donald Trump is continuing to go after Attorney General Jeff Sessions on Twitter. On Wednesday morning, Trump asked why Sessions had not replaced Andrew McCabe, the acting director of the FBI, after Trump fired former director James Comey, Politico reports. Wednesday is the third straight day when Trump has attacked Sessions publicly. 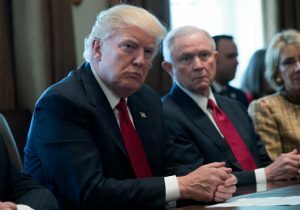 Trump has gone after Sessions for recusing himself from the probe into the Trump campaign and Russian meddling in the 2016 election. Trump's criticism has brought on speculation that he will attempt to replace Session. Sessions was the first U.S. senator to endorse Trump's campaign and has reportedly stated he is not going to resign. He called Sessions "beleaguered" on Monday and "very weak" on Tuesday via his Twitter account. Trump's critiques of Sessions began last week when he told the New York Times that he would never have nominated him for attorney general if he knew Sessions would recuse himself from the Russia investigation.